Paramount Music was born in 2011 when drum and bass enthusiasts Silvio Perano and Paul Parish decided to direct their combined love of the genre into production and DJ’ing. The pair had met through the local scene, and with London’s underground movement close by, they took inspiration from deep, soulful beats at a young age. 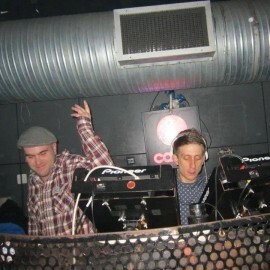 The duo founded the club night “Inter:Act” with a view to promote local DJ talent; and several successful events played host to headline artists Foreign Concept, Krakota and Script to name a few; getting the boys local recognition and driving their ambition to produce exciting new material. Over the years the young pair worked hard on their DJ skills and could be found playing at Hertfordshire club nights Liquid Soul and Masterplan, warming up for the likes of D-Bridge, Alix Perez and Sigma. 2013 proved to be a great year with gigs on the ‘Exit’ stage at Farr Festival along with a set at Cable, London for a ‘Lifted Records’ night, rubbing shoulders with veterans Spor, Memtrix, Neonlight and Mefjus. Paramount’s signature style stems from a passion for deep, emotive dance floor music which of course includes the more soulful side of DnB, taking huge influence from artists such as Calibre, Mutt, Random movement and D-Bridge to name but a few. 2014 has already seen Paramount make significant strides forward, culminating in being selected as one of only two artists to become part of the in house team here at Broken Audio Recordings. With a series of releases and gigs lined up for the rest of the year, and their own monthly podcast in full swing, the future is looking very bright for these two aspiring and passionate producers. 1. What is the high point of your musical career to date? Playing @ Farr Festival in 2013. We were on before D-Bridge in front of an amazing crowd, the vibe was absolutely epic and the set went off which is always a plus! Catch us there again for Summer 2014 (plug alert...) ! 3. Name a track by another producer you wish you had made? Vocodex. It makes most elements in our track sound better… 90% of the time. We have many different influences, but we find we are most inspired after a classic night at Fabric.